The Vosges Ride promised to be an epicurean extravaganza, with spectacular riding thrown in to boot. It began with 9 riders and 8 bikes: Rudi von Vollmar, Del Boy (known to Interpol as “Steve Hawkins”), Clive and Janis Rees, Chris and Ruth Smith, Paul Fulwood, Marius Bekker and myself. Rudi and I left London mid afternoon on Wednesday 1 July to rendezvous with the others at Maidstone services on the M20 en route to an 18:20 Eurotunnel. Despite the closure of the M20 for over an hour while the emergency services cut a driver out from a horrific looking crash (vehicle inverted and unrecognisable, helicopter ambulance etc. ), we made good progress and arrived in Arras for the night. 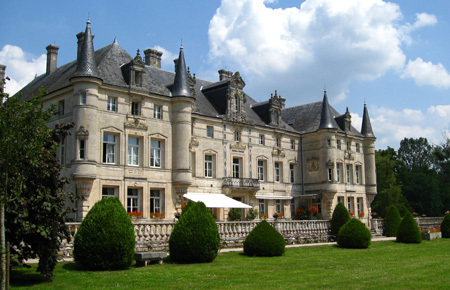 Thursday morning was warm and bright and we made excellent, though necessarily tedious, progress down the A26 and A4 to our usual lunchtime venue near Verdun, Château des Monthairons (we try not to slum it), where they were awaiting our arrival, 4 minutes later than scheduled! After a refined lunch, unfortunately we lost Chris and Ruth. Chris had received word that his mother had been rushed to hospital and they turned back for Blighty. Thankfully, Chris’ mother turned out to be okay. So, our reduced party pressed on, off the motorway now, following the meandering banks of the Meuse, towards Nancy and our base in the Vosges, the small town of La Bresse. During the winter, it is a ski resort but is largely deserted in summer, which suited us just fine. Friday was planned as a very full day of riding but the weather forecast was treacherous for later in the day, as it proved. The morning’s ride took us along the northern half of the Route des Crêtes (crest road), a road running north to south along the ridge of the Vosges mountain range and built by the French during WWI as a supply route. It is now a bikers’ paradise. The highest point in the Vosges is Le Grand-Ballon at 4,593ft, from where you can see eastwards to the Rhine valley and the Black Forest mountains on the other side, and on a clear day the Haut Jura to the south and beyond to the Alps, which appear tantalisingly within grasping distance. Alas, for us on the day, it was too hot and hazy to see much beyond the Rhine. No matter, onwards along the Route des Crêtes, stopping at a German military cemetery (Breitenbach), for this whole area is littered with WWI sites, having been the theatre for some of the most bitter and unrelenting fighting of that conflict due to its strategic importance. We made our planned lunch stop still dry, a charming little hotel with a magnificent restaurant and the friendliest of hosts. The thunderstorm that now ensued almost tempered the quality of the lunch. 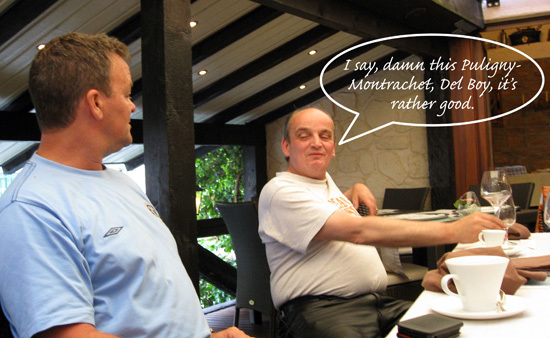 Mon Dieu, did it rain!... and rain, and rain... There was no alternative but to sit it out. One look at the road and the word “aquaplane” projected out of the moisture. By 16:00, it was clear that the rest of the day’s itinerary was shot to bits. 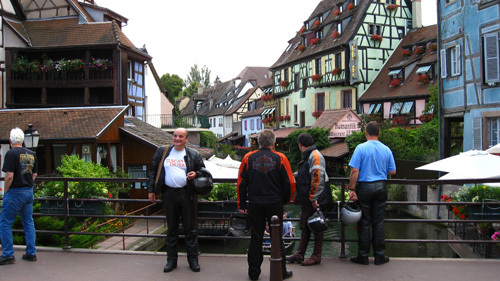 A pity, because the plan had been to take tea at the Château du Haut-Kœnigsbourg and ride through the Alsace vineyards, a wonderfully lazy, scenic ride and then loop back westwards through rolling forest roads to rejoin the Route des Crêtes at its northern end. When we finally decided that we could tackle a little precipitation, we headed back towards La Bresse, some 50 miles away. There was, however, no realistic way of avoiding going back up into the mountains and, as the rain had begun to ease, we set off in good cheer anticipating warm baths (or showers, if you are Clive and Janis) and further conviviality back at the hotel. Yet, fate has a way of testing even the most equable of temperaments. As we crested the top of the mountains, Rudi picked up a puncture to his front tyre. Flat as a flat thing at an annual convention of flat things! 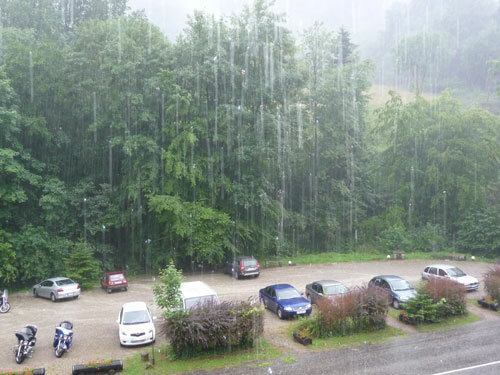 Now, although the thunderstorm had abated, the weather was not great. 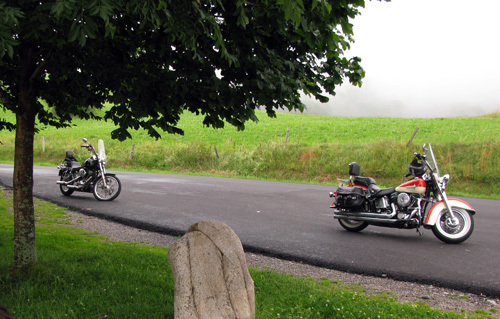 All around us, cloud banks were poised to roll down from surrounding peaks and envelope us, and give rise to the legend of the “Missing Bikers of the Vosges”. As Rudi’s bike had spoked wheels, no Heath Robinson remedies recommended themselves. After a plaintive call to HOG Assistance, Clive led the party back to the hotel courtesy of his Zumo 550, while I stayed with Rudi to ensure he did not get up to too much mischief with the fauna. We awaited HOG Assistance... and we waited. Now, the Vosges mountain goat is a pretty cute specimen as goats go, I suppose, but after 3 hours of tedium, having supplied HOG Assistance with the exact GPS co-ordinates, the road number and distance and direction from nearest town, only to be told... “we can’t find you, could you give us the local postcode?”, little “Billy” began to lose any charm he may previously have had. Cut a long story short, at around 22:00 as darkness loomed, the man with his van stumbled upon us and we were saved. With Baron Rudolf riding pillion, we charted our way back to the hotel along the Route des Crêtes in the dark, an interesting experience. Guess what? We arrived to find the others well advanced on their journey of understanding viz the local viticulture. They hadn’t waited for us - how selfish is that, I ask you? Saturday proved to be Friday’s redemption. The plan was to ride up to the top at Col de la Schlucht and then descend into the Valley of Munster for coffee in the town square, en route to lunch in Colmar. We caught a heavy squall descending into the valley but, undeterred, took refreshment and made Colmar on time. Colmar is a regional town, with a pretty quarter nicknamed “Little Venice” on account of its canals. A gastronomic delight was lined up for lunch in “Le Marechal”, a Michelin rated restaurant right in the heart of Little Venice. Beforehand, we had drawn up a 4 course bespoke menu and they specially printed the menus for us as a souvenir, which was a wonderful touch. The food, drink and camaraderie were of the highest order and we were in there for hours. This luncheon was arguably the social highlight of the whole ride. There was nothing for it; we would have to walk it off afterwards along the canals before mounting our respective steeds and sallying forth into the mountains. From Colmar, a short ride took us to the southern end of the Route des Crêtes, enabling us to ride it northwards in one complete stretch. 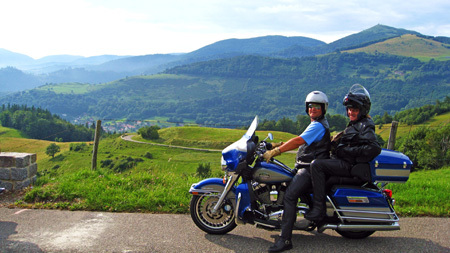 From the Route’s start at Cernay on the low ground, the Vosges mountains stretch northwards along the Western side of the Rhine valley. The weather was now being kind to us and surveying the clear tops, we resolved to go for it. Climbing steadily, the views were magnificent in the late afternoon and this time from Le Grand-Ballon, we could see for miles. The riding was a sheer pleasure, gentle in parts, twisting in others but, with virtually nothing else on the road, we felt like we were in our own playground. Ah, this was what it was all about. That evening back at the hotel, despite lunchtime’s rigours (hey, life’s tedious but somebody’s got to do it), we were surprisingly esurient and decided to go native and reconnoitre a local Vietnamese restaurant. It didn’t challenge what had gone before. Sunday presented us with a long ride back to Calais. At least the weather looked passable and so it turned out, with us having to outrun the rain only once just north of Rheims. Motorway all the way and we reached Calais an hour and a half early. Somehow, Marius and I managed to queue jump onto a train ahead of the others - don’t ask me how - but we re-joined the others at Folkestone for the ritual back slapping and parting wishes. Another one completed. My thanks to my fellow riders for making this a truly fun ride.